So I’m planning on redoing Storming Dawn. And I think I might drop the Storming Dawn title. I haven’t come up with anything catchy yet, but I’m going to rebrand this more as a writing/personal blog based about my own name. As you can see, I’ve already worked on a new design theme. I’m liking this already. First of all, you’ve probably already noticed that the links have changed. I’ll be fiddling with this later to perfect this and hopefully it will make more sense. I actually have some really cool ideas that I would like to try, based somewhat off of a few Brony PMVs I’ve seen lately. (That’s Pony Music Video in case you’re curious. Took me forever to figure out what that meant). But that would take far too much time and a whole lot of work. Not to mention learning how to code CSS and other sort of crazy things. So that’s probably not going to happen. I’ll just say it. Caitlyn had another seizure this week. I really thought we were over this. And I’m sick of this entire ordeal. It seems to be Breath-Holding Spells, but the strange thing is that she’s having postitical periods–AKA periods of lethargy–after each incident. However, this isn’t consistent. In truth, they don’t know what’s going on with her and neither do we. Before you ask, she’s just fine. She was fine within a few hours. But it looks like we get to do ANOTHER EEG and MRI. Whee. I can barely contain my excitement. Now, time for a little personal confession. I don’t deal with these incidents well. When Caitlyn’s first seizure happened, it started around the time Mass Effect 3 launched. I was playing that a ton during that time and instead of dealing with the emotions of what was going on with Caitlyn…I focused my emotional energy on that game. And if you’re reading this, you probably know that Mass Effect 3’s ending was…controversial, to say the least. For me, it was emotionally devastating. Because without that focus, both things crashed down upon me like tidal waves and I wasn’t ready. Well, I’m a creature of habit, so that same thing happened this week. I ended up hyper-focusing on various things…primarily Pony-related. And it was like a lens that just amplified my emotional states. *Sigh* So it’s been a hard week. Though the instigators of these issues were ironically two of the most beautiful MLP:FiM things I’ve ever watched. Well, either that or I’m stark raving mad. I’m still on track for publishing one of my stories at the end of the month, despite the derailment of Caitlyn’s last seizure. 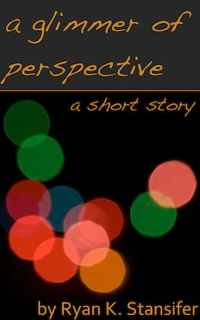 Either “Glimmer of Perspective” or “Beyond the Waterfall” will be out on Kindle by the start of September. Soul of the Scribe is getting a once-over by a friend of mine. She’s studying it and looking for any way to expand the story from 42K to 60K. I have a few ideas playing around in my head. I’m kinda annoyed I’m going to have to work on it again. I want it to be done. I want people to be enjoying the darn story. But novellas are damn near impossible to publish traditionally. And I don’t want to self-publish. From what I’ve seen, it’s not worth it. Okay, that’s pretty much it for this week. But I’ll be continuing my posting about Pony-related videos. I’m sorry folks, but I have come down with a terminal case of Brony. You’ve seen my own posts about it in the past. I’m actually making some tentative plans to get involved into the Brony community, because I like what I see. Before you throw a fit about that, remember there’s always the vocal or crazy minority that never represent the whole. What I see is something new…and something that celebrates love and tolerance. I don’t know about you, but when I look at the state of the world, I think we need some more of that. So here we go. Have some Love and Tolerance. You’re going to take it and you’re going to enjoy it, darn you. Okay, that’s it for this week. I had some thoughts about the direction Blizzard is going with World of Warcraft (namely that they’ve just given up on giving the Alliance any meaningful story progression), but that’s for another time. I’m somewhat annoyed. My lunch I brought today turned out to be bad. Besides having to spend money on mall food (which is far more expensive than it should be), it throws off the amount of time I have for writing work. You see, my primary writing time is the 45-50 minutes I get on my lunch, excluding walking time to heat food, get to my car, etc. Anyway, you don’t care about what I’m eating at the moment. You’re here for stories. Well, you, the other person and the five hundred scripts and robots. One of these days I need to work on getting out there more. But that’s for later. I’m happy to report that “A Glimmer of Perspective” is up to Version 5.2 and “Beyond the Waterfall” is up to Version 2.1. I think I’m on target for publishing one of them on Kindle by the end of the month. As for Agents and such, I haven’t made much headway. I’ve got some folks in mind, but it’s a very short and rough list. What’s more important is I need to work on my query letter…but again, I’m somewhat troubled by Scribe being a novella. While I wish I could expand it out to 60K to get it to the lower side of novel…it would be 16K of padding…and that’s just absurd. The only way I see that working is if I make it a duology. One of my friends recommended self-publishing or sending it to a small press. The second option I like…the first…not so much. Mhr. I’m still waiting for my food and I don’t think well on an empty stomach. Anyway, I need to stay committed. I’ve done well so far with my editing. But now it’s time to start actually working on the publishing side. And I think I’ll have to force myself to not play a game or something and start the research and the work. So my goal for next week? To have a query letter done. Either that, or be full on power to get another novel ready for publishing. Okay, so, I’ve been ending each post with some random YouTube video I like lately. I’ve found that I enjoy doing this. And I hope the two of you humans and the 500 of you machines enjoy it too.